The Alzheimer's Society group, 'Memory Lane' in Glossop were the first to host workshops for the new project Stitching the Wars. 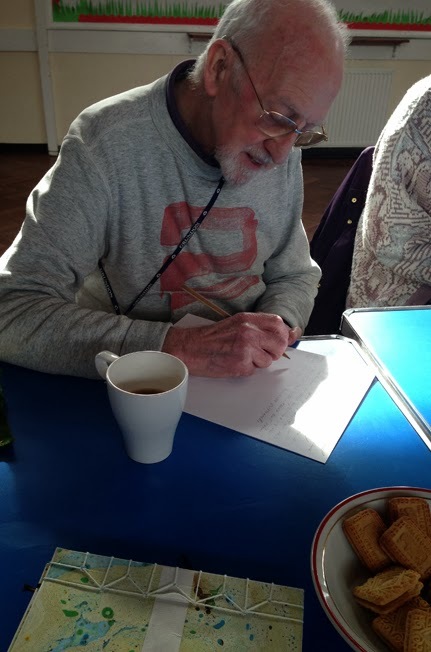 Over the next two years we will collaborating with older people in Derbyshire, creating artwork and poetry from the reminiscences of the First and Second World Wars. This year we are focussing on THE LAND, stitching together a living, emotional document of that time, contrasting the so-called gentleness of rural life and traditions, with the hardship and the need to change. So how to turn memories into artwork, an artwork that many people can contribute to according and adapted to their different time and health constraints? We have decided to follow up on the successes and learning from the project the warm and the cold, in which we collaborated with homeless people to make a embroidered quilt. One of the techniques I've been sampling is the traditional English Patchwork technique of 'pieced patchwork'. Patchwork has been practiced both as a practical and decorative craft for centuries re-using scraps of fabric into precious quilts. 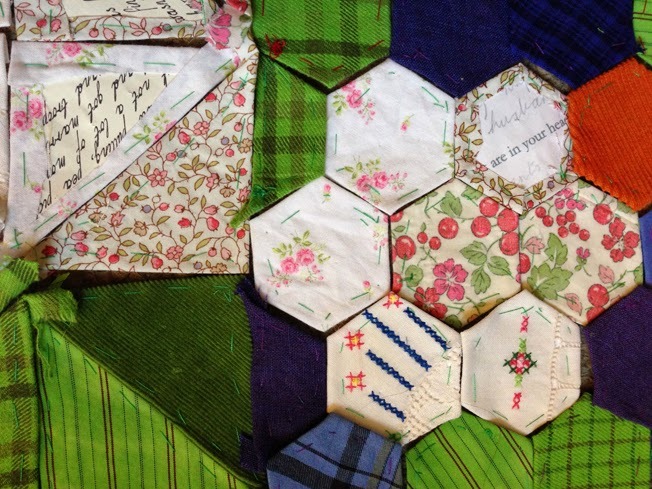 Paper pieced patchwork has fabric wrapped around paper cut to exact size and shape. A wide variety of shapes are used, however the hexagon shape is the most common, you can see mine below in one of the many different patterns I've been sampling. 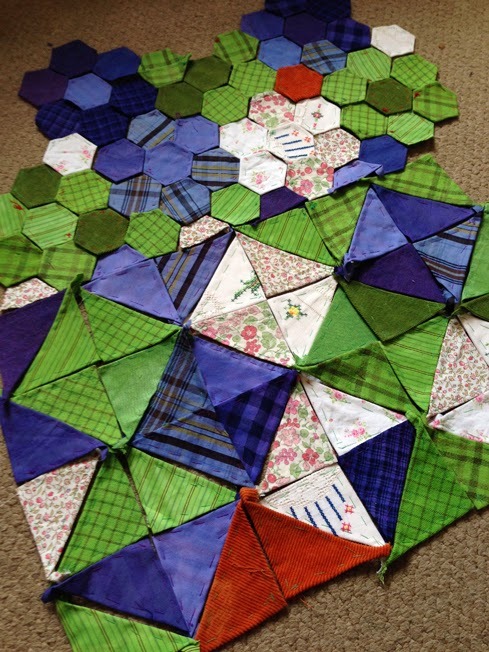 Sampling different layouts for the 'pieced patchwork'. 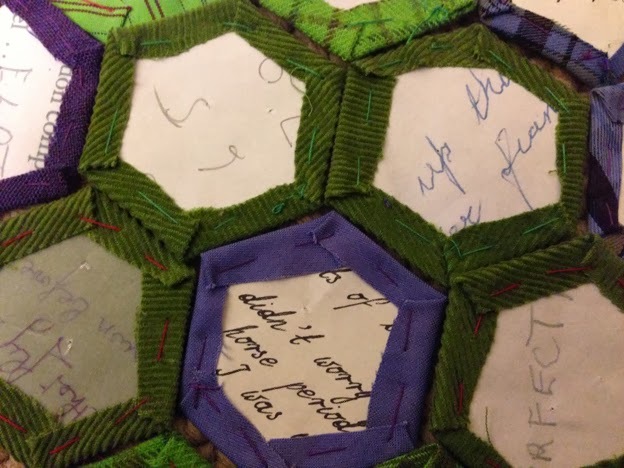 One of the attractions for me to the technique is the reverse of the quilt, the paper holding the hexagon (or other shape) together gives space for writing; a single word, or fragments of reminiscence, sewn together in unexpected at times random patterns, reflecting the transient nature of the conversations had during the project, many voices making a whole. Well thats the theory. The reverse of the paper pieced patchwork, with fragments of reminiscence typed and handwritten. 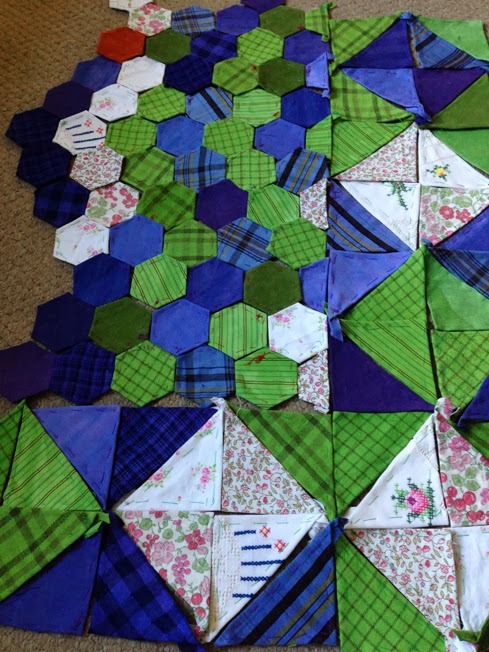 As the project progresses we will start working with more groups of people who will contribute their own ideas on the content, their stitching and design suggestions, the quilt will take on its own life. Non of our group in Glossop had made a living from the land, but all shared some experience of it. Three had been evacuated during the war, 1 to Blackpool, 1 to Broadbottom, 1 to Hadfield. The country made a big impression on them as youngesters. At nine years old Brian did a milk round on the horse and cart, In theory we were allowed to drive the horse, but in practice it did its own thing. The horse led the way, plod along then stop, plod along then stop. Brian recalled with a smile a less gentle experience of country life: Collecting potatoes, for work experience. 6p with all my earnings. Was soaked through, they tied a sack to me back, put a nail through the sack instead of a button, picking up the potatoes with me hands. In me school shoes up to there in muck, slave labor for the lad. 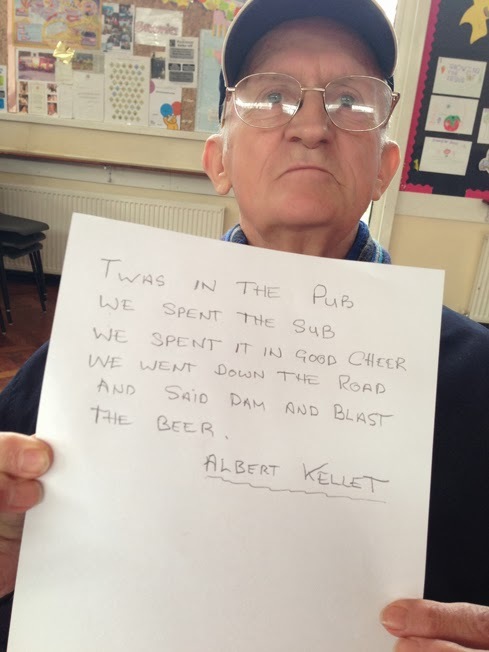 He also shared memories of his alcoholic grandfather, Albert Kellet. Once he was sober he was alright, but everytime I went to Grandmas she had a black eye. Grandfather was always scrapping, a split lip… he was a brilliant joiner, but not when he was drinking. He taught Brian the poem he holds in the picture below. Brian Sawyer recalling his Grandfather. The pieces that the group wrote will be scanned and printed onto paper to make the pieced quilts, stitching them down for another day. sampling- flipping the back and the front. Thanks goes for the warm welcome I received from the group at Memory Lane, for everyone to share their memories, spoken and written and to Meena for a constant flow of tea, biscuits and good cheer.